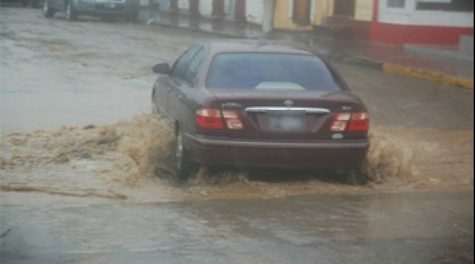 In light of the recent hurricanes and torrential rains that pounded St. Kitts and Nevis, a Solid Waste Management Corporation (SWMC) official is reinforcing the importance of keeping the drains and waterways free of debris and garbage. Operations Officer Valentine Heyliger pointed to the challenges that have derived from the recent weather activities, caused in part by indiscriminate dumping with garbage blocking drains and waterways. “You mixing garbage with good water and some of that water might reach into proper storage areas and you are contaminating the water and it goes into the sea…you are giving the country more work when you do that,” Mr. Heyliger said. “The garbage can cause the drains to block up. And then you have the breeding of mosquitoes and then you have mosquito borne diseases…we don’t want to get those (diseases) resurfacing again so please, people, do the right thing. Do not throw (garbage) in the waterways, do not throw them in the ghauts. Wait until your scheduled time to pick up your garbage and dispose of your stuff properly,” he said. Some business establishments on the Bay Road were flooded, albeit temporarily, two Saturdays ago when heavy rains fell on the island. College Street Ghaut, one of the major waterways in the nation’s capital, is one that gets special attention from the SWMC, Mr. Heyliger pointed out. “In College Street Ghaut, three times per week (garbage pickup is done)—Monday, Wednesday and Friday. So there is no excuse to throw stuff in the Ghaut. If you have stuff that the garbage truck doesn’t pick up, you get a hauler and you take it to the landfill,” Mr. Heyliger said. He added that to dispose items like white goods (appliances: fridges, stoves and mattresses) only cost $5 per item. Meanwhile, Mr. Heyliger reiterated the penalties persons can face if caught littering. “You could get yourself in trouble because you get caught, it’s $500 we are going to charge you. And if you refuse to pay, the court will charge you from $5000, up to $20,000. You don’t want to go through all that because you told yourself you don’t want to catch the garbage truck or you don’t want to (get a hauler),” he said.